Ganesha Chaturthi is the Hindu festival celebrated on the birthday (rebirth) of the Lord Ganesha, the son of Lord Shiva and Goddess Parvati – Gaṇesa also spelled Ganesh, and also known as Ganapati or Ganapathy and Vinayaka, is a widely worshipped God in Hinduism. The name Ganesha is a Sanskrit compound, joining the words gana (Sanskrit: गण; IAST: gaṇa), meaning a group, multitude, or categorical system and isha (Sanskrit: ईश; IAST: īśa), meaning lord or master.The word gaņa when associated with Ganesha is often taken to refer to the gaņas, a troop of semi-divine beings that form part of the retinue of Shiva (IAST: Śiva). The term more generally means a category, class, community, association, or corporation. Some commentators interpret the name "Lord of the Gaņas" to mean "Lord of Hosts" or "Lord of created categories", such as the elements. Ganapati (Sanskrit: गणपति; IAST: gaṇapati), a synonym for Ganesha, is a compound composed of gaṇa, meaning "group", and pati, meaning "ruler" or "lord". The Amarakoshar, an early Sanskrit lexicon, lists eight synonyms of Ganesha :Vinayaka, Vighnarāja (equivalent to Vighnesha), Dvaimātura (one who has two mothers), Gaṇādhipa (equivalent to Ganapati and Ganesha),Ekadanta (one who has one tusk), Heramba, Lambodara (one who has a pot belly, or, literally, one who has a hanging belly), and Gajanana (IAST:gajānana); having the face of an elephant). Vinayaka (Sanskrit: विनायक; IAST: vināyaka) is a common name for Ganesha that appears in the Purāṇas and in Buddhist Tantras. This name is reflected in the naming of the eight famous Ganesha temples in Maharashtra known as the Ashtavinayak (aṣṭavināyaka). The names Vighnesha (Sanskrit: विघ्नेश; IAST:vighneśa) and Vighneshvara (विघ्नेश्वर; vighneśvara) (Lord of Obstacles) refers to his primary function in Hindu theology as the master and remover of obstacles (vighna). A prominent name for Ganesha in the Tamil language is Pillai (Tamil: பிள்ளை) or Pillaiyar (பிள்ளையார்).A. K. Narain differentiates these terms by saying that pillai means a "child" while pillaiyar means a "noble child". He adds that the words pallu, pella, and pell in the Dravidian family of languages signify "tooth or tusk", also "elephant tooth or tusk".Anita Raina Thapan notes that the root word pille in the name Pillaiyar might have originally meant "the young of the elephant", because the Pali word pillaka means "a young elephant". In the Burmese language, Ganesha is known as Maha Peinne derived from Pali Mahā Wināyaka.The widespread name of Ganesha in Thailand is Phra Phikhanet or Phra Phikhanesuan, both of which are derived from Vara Vighnesha and Vara Vighneshvara respectively, whereas the nameKhanet (from Ganesha) is rather rare. In Sri Lanka, in the North-Central and North Western areas with predominantly Buddhist population, Ganesha is known as Aiyanayaka Deviyo, while in other Singhala Buddhist areas he is known as Gana deviyo. 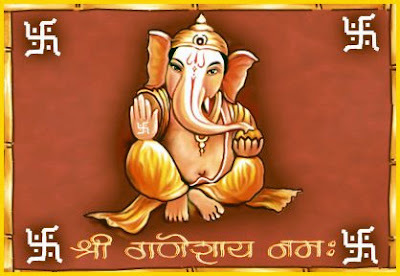 It is believed that Lord Ganesh gives his presence on earth for all his devotees during this festival. It is the day when Ganesha was born. Ganesha is widely worshiped as the god of wisdom, prosperity and good wealth and usually invoked at the beginning of any new venture or at the start of travel. 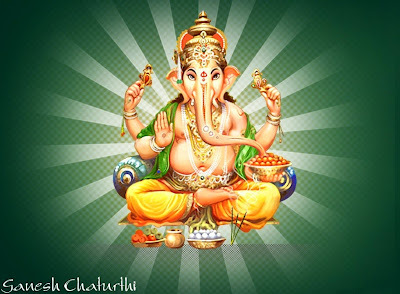 The Ganesh Chaturthi festival also known as Vinayaka Chaturthi ("festival of Ganesha") is observed in theHindu calendar month of Bhaadrapada, starting on the shukla chaturthi (fourth day of the waxing moon period). The August 25, 2017 Friday and ends on Anant Chaturdashi September 5, 2017. The festival lasts for 10 days, ending on Anant Chaturdashi (fourteenth day of the waxing moon period). During these 10 days, there are traditions and rituals that people perform during the Ganesh Chaturthi Hindu festival. People begin preparing months in advance by making check lists, selecting eco-friendly idols, reading up yummy recipes and thinking of innovating decoration ideas to celebrate the festival in an ostentatious manner. Hindus also follow the rituals in Bringing Home the Ganesha Idol, many of whom choose to perform the Ganesh Staphna (Installation of the Idol) by themselves including performing the Ganesh Visarjan (Immersion). While celebrated all over India, it is most elaborate in Maharashtra, Gujarat, Tamil Nadu, Goa, Andhra Pradesh, Karnataka,Odisha,Kerala and Chhattisgarh. Outside India, it is celebrated widely in Nepal and by Hindus in the United States, Canada, Mauritius, Singapore, Malaysia, Thailand, Cambodia, Burma, Fiji, Trinidad & Tobago, and Guyana. Traditional Ganesha Hindu stories tell that Lord Ganesha,son of goddess Parvati consort of Shiva. Parvati created Ganesha out of sandalwood paste that she used for her bath and breathed life into the figure. She then set him to stand guard at her door while she bathed. Lord Shiva, who had gone out, returned and as Ganesha didn't know him, didn't allow him to enter. Lord Shiva became enraged by this and asked his follower Ganas to teach the child some manners. Ganesha who was very powerful, being born of Parvati, the embodiment of Shakti, defeated Shiva's followers and declared that nobody was allowed to enter while his mother was bathing. The sage of heavens, Narada along with the Saptarishis sensed the growing turmoil and went to appease the boy with no results. Angered, the king of Gods, Indra attacked the boy with his entire heavenly army but even they didn't stand a chance. 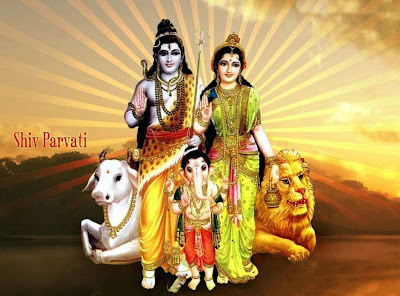 By then, this issue had become a matter of pride for Parvati and Shiva. Angry Shiva severed the head of the child. Parvati seeing this became enraged. Seeing Parvati in anger Shiva promised that her son will be alive again. The devas searched for the head of dead person facing North, but they found only the head of a dead elephant. They brought the head of the elephant and Shiva fixed it on the child's body and brought him back to life. Lord Shiva also declared that from this day the boy would be called Ganesha (Gana Isha : Lord of Ganas). Indian freedom fighter and social reformer Lokmanya Tilak, who was instrumental in making this domestic event a national public festival. He recognized the potential of the celebration to bridge the gap between local communities and castes, and also used it to generate a nationalistic fervor against the British colonial rule. Under his guidance large statues of Ganesha were displayed in public and on the tenth day were submerged in nearby rivers or in the ocean. This tradition is followed till date. Tilak encouraged community cooperation and involvement by setting up intellectual discourses, poetry recitals, plays, traditional musical concerts and folk dances. All these events served as a platform to bring people together. The chief dish prepared during the festival is the modak. A modak is a dumpling made from rice flour/wheat flour with a stuffing of fresh or dry-grated coconut, jaggery, dry fruits and some other condiments. It is either steam-cooked or fried, and offered to the god before being distributed to the family.